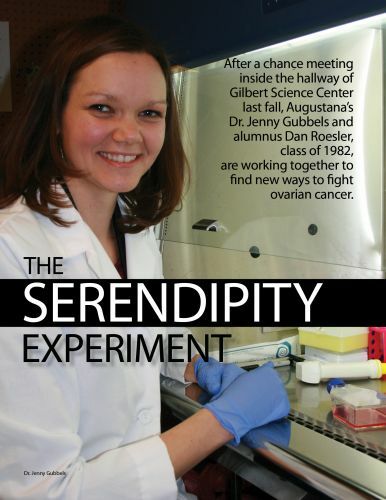 Dr. Jenny Gubbels and alumnus Dan Roesler, class of 1982, are working together to find new ways to fight ovarian cancer. They say serendipity is all about theunexpected collision of time and space and accidental discoveries. So it’s safe to say that the chance meeting between Dan Roesler, class of 1982, and Dr. Jenny Gubbels, an assistant professor of Biology, on a Friday afternoon last fall was serendipity at work, aided, perhaps, by the gentle nudging of one very special angel. It was late in the day on the Friday of Viking Days weekend when Gubbels, a specialist in physiology and cancer immunology whose research focuses on ovarian cancer, was searching for a piece of lab equipment. As she walked through the first floor hallway of Gilbert Science Center, she noticed a man quietly looking at a research poster hanging on the wall. Roesler found himself on campus by chance. He wasn’t planning on attending his 30-year class reunion but, on his way back from Montana to his home in Iowa, he decided to stop on a whim, thinking it might be fun to see his former classmates. A physics and math major at Augustana, he recalled the many hours he’d spent inside GSC and decided to take a stroll through. He stopped first in the entryway to take in the natural habitat displays, then headed downstairs to walk through the math department — the area his wife, Cindy (Ballentine), class of 1983, studied as a math major. The building, originally built in 1966, looked just as it did when Roesler was a student. From the basement, he walked up GSC’s back stairway and found himself face-to-face with a research poster on ovarian cancer. He caught his breath, felt that familiar ache in his heart, and started reading. The memories were almost crushing. He heard footsteps and turned to see Gubbels walking down the hallway. “Can you tell me who did this research?” Roesler asked her. Gubbels took an uncertain step forward. She quickly realized the man was looking at her research poster — an illustration of the work she’d done the summer before on ovarian cancer. “I did,” she told him. The poster, Roesler told her, was the best explanation he’d ever seen of why his wife — his best friend — had died from ovarian cancer in 2007. Gubbels’s poster illustrated the reasons how and why his wife first developed cancer, and how and why it had spread so ferociously. “That poster ... it was Cindy. It brought back so many memories. It was so on-the-spot. The poster checked off everything we went through. You know, when you’re going through it, it all happens so fast and the explanations aren’t always there about ‘how’ and ‘why,’” Roesler said. Roesler and Gubbels talked for a while that afternoon. He learned a bit more about her research, and learned that Augustana students routinely work alongside Gubbels and her colleagues in the Natural Sciences division through the College’s Undergraduate Summer Research Program. After their visit, Roesler headed off to see classmates before returning home to Iowa, to the house he once shared with Cindy. But no matter how hard he tried, he couldn’t shake the coincidence of meeting Dr. Gubbels. Dan Roesler met Cindy at Augustana in 1980. He’s a native of South Dakota and grew up near Spencer. She was a native of Glendive, Mont. After graduation, they married and Roesler went on to earn his master’s degree in physics from South Dakota State University. Cindy also earned her master’s in math and taught for a time in Brookings, S.D. Eventually, they both earned jobs at Rockwell Collins, an avionics company based in Cedar Rapids, Iowa. They spent their careers there — he in the engineering research group; she in the software group. They never had children, but enjoyed spending time with their three black labs. Together, they toured the Midwest on their motorcycles and were avid lovers of nature and the outdoors. After years of struggling with endometriosis, Cindy was 42 when doctors discovered a growth which, at first, they believed was a fibroid tumor. In 2002, after further testing, Cindy was diagnosed with ovarian cancer. Doctors gave her five years to live. The couple vowed to fight the disease … together. They opted for surgery to remove the tumor, which at the time was the size of a softball. Within a year, the tumor had grown back to the same size. The couple searched frantically for new treatment options and second opinions. They sought treatment from the Mayo Clinic in Rochester, Minn., to address the second tumor. Doctors there did surgery to remove it and gave Cindy an optimistic prognosis. “The second tumor was removed very cleanly and by 2005, we thought we had it whipped,” Roseler said. In 2006, Cindy learned the cancer had metastasized in her lungs. The couple decided to take one last trip on their motorcycles, zig-zagging over Bear Tooth Path, on the edge of the mountains, just outside Red Lodge, Mont. In early 2007, Cindy died. She was 47 years old. “There are so few markers for ovarian cancer. It’s a nasty disease that takes women in the prime of their lives. When Cindy was struggling with endometriosis in her mid-20s, had we known that [the condition] can be a pre-cursor for ovarian cancer, we might have opted for a hysterectomy,” Roesler said. “It’s so tragic that these young females in the prime of their lives get their lives cut short,” he said. Maybe it was Cindy’s memory, or what they went through together, or all the “what-if’s” ... whatever it was, Roesler couldn’t stop thinking about that chance meeting with Dr. Gubbels. At the same time Cindy Roesler was battling cancer, Jenny Gubbels was completing her undergraduate degree at Loras College in Dubuque, Iowa, and was preparing to begin her Ph.D. studies at the University of Wisconsin, Madison. She was driven she says, by the harshness of the disease. According to the National Cancer Institute, more than 22,000 new cases of ovarian cancer were diagnosed in the U.S. in 2012 and more than 15,000 women died from the disease. Based on rates from 2007-2009, the office of Surveillance Epidemiology and End Results estimates that one in 72 women will be diagnosed with cancer of the ovary during their lifetime. While survival rates depend on the stage at diagnosis, ovarian cancer’s average five-year survival rate is 43.5 percent for white women and 36 percent for black women. Gubbels describes the progression of the disease in an easy-to-understand way. Gubbels said the chance meeting with Roesler in the hallway that Friday afternoon made a significant impact on her. “It’s easy to get caught up in the research – how the cells travel, what proteins are involved … all that stuff. In reality, sometimes you forget it’s a cell in someone’s body and that person has people who love them. Meeting Dan was such a stark reminder that what I’m doing has a purpose … that the work I do with students could lead to something bigger, something that could prevent people from dying,” she said. At home in Iowa, Roesler reached out to Gubbels via email. He was interested in learning more about her research and he wanted to find out more about the opportunities for student-faculty research collaboration. Gubbels connected the experience to her students. After learning more about Gubbels’ work, Roesler decided to make a gift to Augustana in support of her research. His pledge of more than $10,000 will help fund paid fellowships for students to work in Gubbels’ lab during the summers. 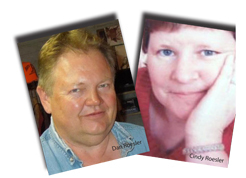 After learning of Roesler’s gift to the College, Cindy’s friends and parents also made gifts to the same fund. The experience was impactful for Roesler, as well. “Meeting Jenny and learning about her work was a real sense of closure for me,” Roesler said.